1Lt Leonard E. Jokerst (P)(KIS) - 16 credited combat missions flown. First mission as CoPilot with Combat Orientation Pilot Lt Arthur C. Way. Killed on a 23 Oct 1943 local night training flight. With 360th BS - One with 1Lt Arthur C. Way as an observer (58)); Eleven with 1Lt Jokerst as CoPIlot (59, 60, 63, 64, 65, 66, 68, 69, 71, 72, 75). Upgraded from CoPilot to Pilot on orders dated 10 Oct 1943. Flew on twelve dispatched (11 credited) missions as First Pilot (78, 79, 82, 83, 85, 88, 92, 101, 102, 103, 104 (Aborted), 105) and 4 credited missions as a Lead Crew Pilot (93, 95,104, 118, 122). Promoted from 1Lt to Captain following mission 105 on 2 May 1944. Completed his 25 mission combat tour on 18 March 1944 (Mission 122) and returned to the USA. With 358th BS - Volunteered for a second combat tour and returned to Molesworth. Was assigned to the 358th BS as a Lead Crewman. Flew 5 missions as a Lead Crew CoPilot - With Capt Lynch (237), With Capt Rosser (243), With LtCol Lyle (244), with Maj Mackin (280) and with LtCol Snyder (344) Flew 7 missions as a Lead Crew Pilot (249, 250, 260, 264, 272, 316, 356). Final 41st credited missions on 15 April 1945 (Mission 360) as Deputy Lead Crew CoPilot with 1Lt William L. McKimmie as Pilot. Was appointed 358th BS Operations Officer on 19 December 1944. Was appointed 358th BS Acting Commanding Officer on 30 March 1945. 2Lt Robert N. DeFeis (B) - Flew on 28 dispatched (27 credited) combat missions: 16 credited missions with 1Lt Jokerst (All Jokerst missions except #79 where a substitute Bombardier was used); 13 dispatched (12 credited) missions with 1Lt Bergeron (78, 79, 82, 83, 85, 88, 92, 95, 101, 102, 103, 104 (A), 105); 1 credited mission with Lt Lloyd L. Holdcroft (93). Combat tour completed on 5 Feb 1944 (Mission 105). T/Sgt Alphonse B. Serwa (E) - Flew on 28 dispatched (27 credited) combat missions: 13 credited missions with 1Lt Jokerst (All Jokerst missions except #66 where a substitute Engineer was used); 11 dispatched (10 credited) missions with 1Lt Bergeron (82, 83, 92, 93, 95, 101, 102, 102, 104(A), 105, 122); 4 credited missions with Lt Hershel R. DeWall (107, 109, 112, 115). Combat tour completed on 18 March 1944 (Mission 122). T/Sgt LeRoy Cline (R) - Flew on 28 dispatched (27 credited) combat missions: 16 credited missions with 1Lt Jokerst (All of 1Lt Jokerst missions); 12 dispatched (11 credited) missions with 1Lt Bergeron (82, 83, 85, 88, 92, 93, 95, 101, 102, 103, 104(A), 105), Completed combat tour on 5 Feb 1944 (Mission 105). S/Sgt Norman A. Hemmings (BTG) - Flew on 29 dispatched (28 credited) combat missions: 10 credited missions with 1Lt Jokerst (58, 59, 60, 63, 64, 65, 66, 68, 69, 79). Substitute Ball Turret Gunners used on 6 missions - T/Sgt A.S. Stevens (71, 72), S/Sgt Arthur B. Ayers (75, 76, 77, 78, 79); 12 dispatched (11 credited) missions with 1Lt Bergeron (82, 83, 85, 88, 92, 93, 95, 101, 102, 104(A), 105); 7 credited missions with other Pilots (109, 113, 115, 117, 120, 121, 122). Completed combat tour on 18 March 1944 (Mission 122). S/Sgt George W. Wilson (LWG) - Flew on 28 dispatched (27 credited) combat missions: 16 credited missions with 1Lt Jokerst (All of 1Lt Jokerst missions); 12 dispatched (11 credited) missions with 1Lt Bergeron (82, 83, 85, 88, 92, 93, 95, 101, 102, 103, 104(A), 105). Completed combat tour on 5 Feb 1944 (Mission 105). S/Sgt William H. Stephen (RWG)(KIS) - Flew on 16 credited combat missions with 1Lt Jokerst (All of 1Lt Jokerst missions). Was Killed on 23 October 1943 on a local night training flight, 1Lt Jokerst Pilot. 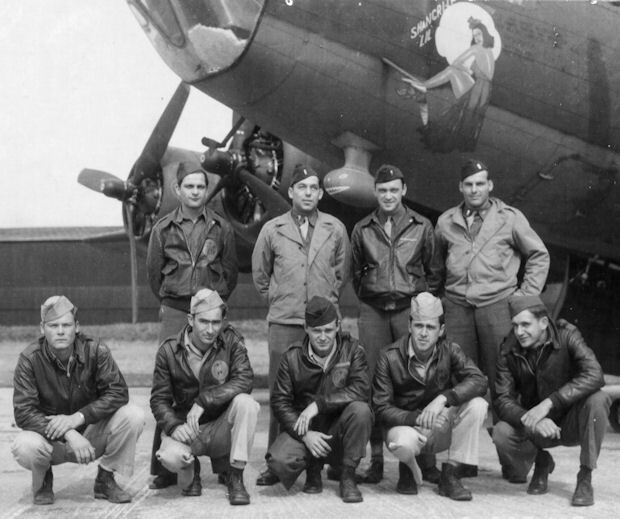 S/Sgt Vernon R. Appleton (TG) - Flew on 28 dispatched (27 credited) combat missions: 15 credited missions with 1Lt Jokerst (All of 1Lt Jokerst missions except #79 where a substitute Tail Gunner was used; 13 dispatched (12 credited) missions with 1Lt Bergeron (79, 82, 83, 85, 88, 92, 93, 95, 101, 102, 103,104(A), 105). Completed combat tour on 5 Feb 1944 (Mission 105). 1Lt James B. Noland (N) - Flew on 28 Dispatched (27 credited) combat missions: 13 credited missions with 1Lt Jokerst (All of 1Lt Jokerst missions except 58, 59, 60); 9 dispatched (8 credited) missions with 1Lt Bergeron (82, 83, 85, 92, 101, 102, 103, 104(A), 105); 6 credited missions with other Pilots (95, 107, 115, 117, 118, 119). Completed combat tour on 8 March 1944 (Mission 119). S/Sgt Wallace L. Tharp (E)(WIA)(POW) - Flew on 11 credited combat missions: 3 credited missions with 1Lt Jokerst (66, 68, 69); 8 credited missions with other Pilots (61, 62, 78, 84, 85, 91, 92, 119). Became a POW on 8 March 1944 (Mission 119), 2Lt Leo B. McGrath (Pilot) flying as Left Waist Gunner. 23 October 1943, Local night training flight, in B-17F 42-29930 Miss Patricia (360BS) PU-I. Crashed shortly after take-off at Keyston, cause unknown. Eight crewmen were killed. Crewmen on the fatal flight were: 1Lt L.E. Jokerst (P), 2Lt T.M. Jackson (CP (*), S/Sgt W.H. Stephen (E)(*), Cpl S.B. Morse (R), Sgt E.A. Chuhran (Pho), Sgt R.L. Long (Gunner)(*), Sgt H.R. Sherman (Gunner) and Pvt R.V. Morgan (Passenger).